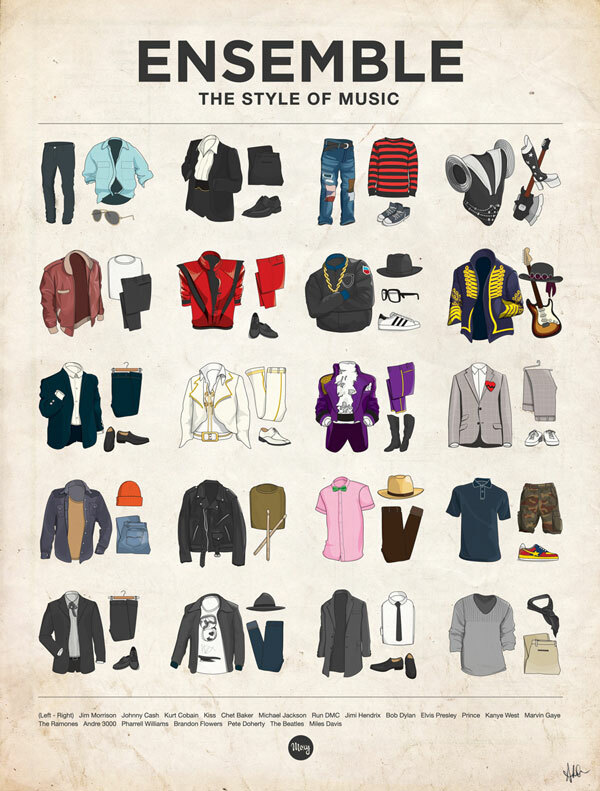 O estúdio Moxi criou pôsters inspirados no estilo de grandes cantores e seus trajes icônicos. Estão ali o blusão listrado do Kurt Cobain, o gorro laranja do Marvin Gaye o os trajes clássicos de Michael Jackson em Thriller e aquela roupa roxa escandalosa do Prince (ou: aquele do qual não dizemos o nome). Além deles, foram registrados os estilos de Chet Baker, Bob Dylan, Pede Doherty, The Beatles e The Ramones, Jimi Hendrix, Kiss, Johnny Cash e muitos outros músicos. It was a clever juxtaposition of Southern good boy and rock ‘n’ roll misfit that quickly thrust him into the role of American heartthrob. 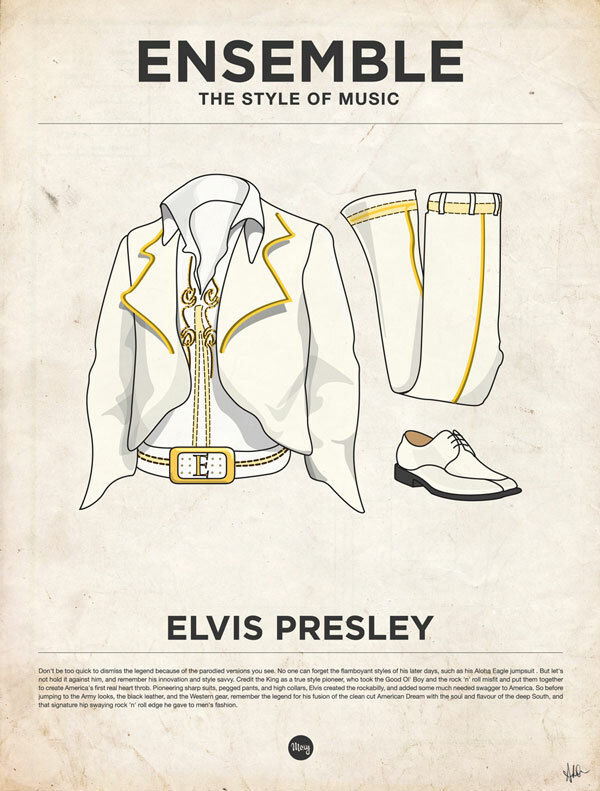 Pioneering sharp suits, pegged pants, and high collars, Elvis popularized rockabilly style, and added some much needed edge to conservative white America. “The Man in Black” with a “broken soul with a heart of gold” would be how entire generations came to know Johnny Cash. Dressed in black suits and leather jackets, his sense of style was dominated by a brooding masculinity, one that never shied away from a subtle sense of melancholy and romance. Like a tortured poet searching for redemption, he was consistently dressed in mourning. 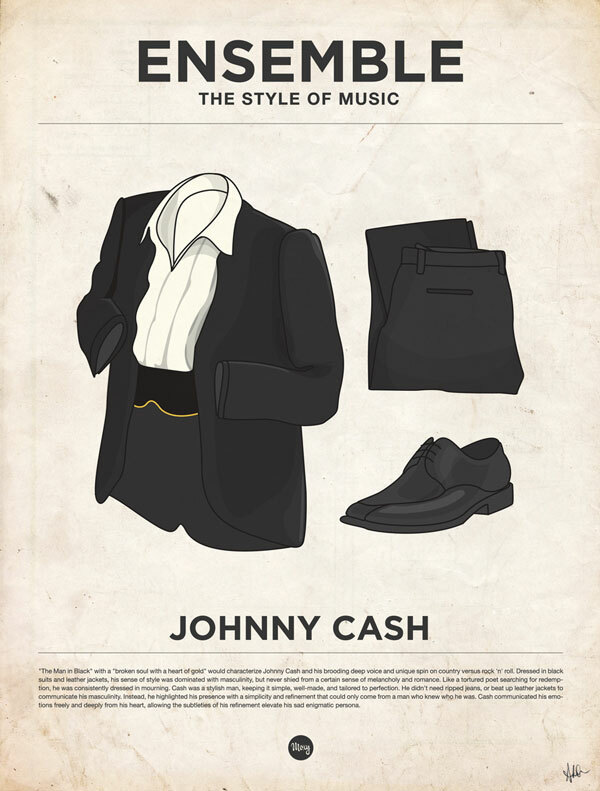 Johnny Cash was a stylish man, keeping it simple, and tailored to perfection. Cash didn’t need ripped jeans, or beat up leather jackets to communicate his rebel style. Instead, he highlighted his presence with a simplicity and refinement that could only come from a man who knew who he was. Para ver os outros pôsters, clique aqui. Agora olha que incrível: para a WMagazine de novembro, Ana Dello Russo mostrou toda sua desenvoltura nas aulas de Glam Pilates ministradas via Skype por moi-même. Ana Dello Ruso aquecendo a panturrilha. Para mais fotos da Ana Dello Russo fazendo Glam Pilates, clique aqui. De 5 de maio a 15 de agosto deste ano, o MET realizou uma exposição chamada American Woman: Fashioning a National Identity. It will explore developing perceptions of the modern American woman from 1890 to 1940 and how they have affected the way American women are seen today. Focusing on archetypes of American femininity through dress, the exhibition will reveal how the American woman initiated style revolutions that mirrored her social, political, and sexual emancipation. “Gibson Girls,” “Bohemians,” and “Screen Sirens,” among others, helped lay the foundation for today’s American woman.